“Taiwan has many historic trails, but the Neng­gao Trail is the most amazing!” So says 81-year-old mountaineer Nelson Young after spending three years on his book A Story of the Neng­gao National Trail. The Neng­gao Historic Trail is Tai­wan’s most internationally known historic trail, and since the release of the film Seediq Bale, interest in it has risen again. This historical site, where the infamous Wu­she Incident occurred, is certainly one worthy of a closer look. Centuries ago, in the far reaches of the Central Mountain Range near the head of the Zhuo­shui River, the Ata­yal and See­diq tribes made their homelands. Over the generations their populations grew, and in need of greater space, a group of people set off from Wu­she to cross the ranges, ultimately settling in the Ta­roko area in what is now Hua­lien County. The Neng­gao Historic Trail, which crosses the mountains between Ren’ai Township in Nan­tou and Hua­lien’s Xiu­lin Township, is the trail these pioneers took, and later became a path used for trading. With this connection, though, came conflict, as peoples of the two sides of the range began to fight over hunting grounds, becoming enemies and eventually being split more than any mountains could have caused. This lifeline for the local tribes, a difficult traverse with a height difference of some 1000 meters, later underwent large-scale renovation at the hands of the Japanese as they sought to “pacify” the Aboriginal peoples. In 1914 the Japanese, lusting for the rich camphor and cypress of Taiwan’s mountainous regions and wanting to finally suppress the resistant Aborigines, launched the Battle of Taroko. Japanese troops assembled in Hualien and Wushe, attacking from both east and west, and the Nenggao Trail was one of the routes by which they launched their attacks on the Truku people. At the time, the warriors of both the Truku and Seediq tribes numbered only some 2,300 and were armed only with simple hunting tools like spears and bows. Pitted against 20,000 Japanese troops with state-of-the-art weapons, they held out through three months of fierce fighting, but ultimately the bloodshed was too great, and effective Japanese rule was extended into the mountains. Three years later, in 1917, the Japanese sent in 60,000 men, not only military but also support staff and some Atayal, to construct a patrol route for the colonial government to begin exploiting the mountains. Finished in 1918, the trail was named the “Chuyin-Qilai Traverse”; however, there is a difference in height of several hundred meters between this, the “old trail” on the eastern section of the Neng­gao Trail, and today’s Historic Trail. Seeing the difficulty of crossing the 3,307-meter-tall Mt. 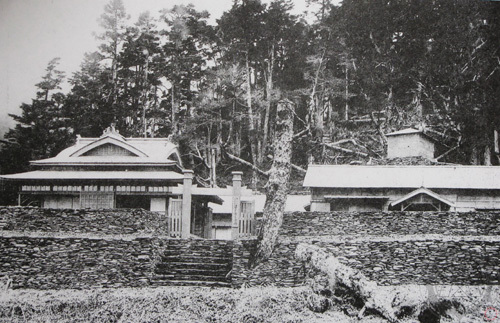 Qi­laili, particularly in the deep snows of winter, in 1925 the Japanese began opening up a trail near Neng­gao Station (today’s Tian­chi Villa) along the mountainside to the saddle at 2,808 m before heading down and to the east, through Kuai­lin, the Chai­tian River, and the Qi­lai River to the Tian­chang Cliffs. 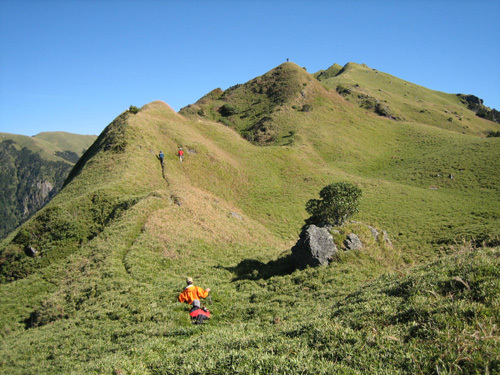 Thus was born the full run of the Neng­gao Trail, running 81.3 kilometers once both the eastern and new western sections of the trail were connected. At the same time as the trail was being built, the Japanese also made full use of the timber available on the eastern side of the mountains, constructing 16 guard stations along the trail from local cypress. Some of these stations also had police stations, offices, and dormitory facilities, and of them, the Neng­gao Station was the best known. An elegantly constructed Japanese-style building, it boasted 10 bedrooms capable of accommodating over 100 people, as well as a refined bathing room. It seems almost inconceivable that at that time, far up in the mountains of Taiwan, there could be such a luxurious setup. According to Nelson Young’s research, the Neng­gao Trail served as both a training ground and an emergency access route for troops on both the eastern and western sides. High-ranking military and civil officials would often make inspections here, and the trail was also a popular hiking spot for the general populace. At one point, 19 teachers and students from Tai­hoku First High School (now Tai­pei’s Jian­guo High School) even hiked the whole length of the trail, spending several days on the journey. Upon reaching the Neng­gao Station and seeing the rolling, thick clouds in the east flowing like a waterfall toward the head of the Ta­luo­wan River to the west, along with the lights of the ­Puli Basin below looking for all the world like fireflies as the night descended, it was as if they’d been whisked into a magical realm. As the temperature dropped into the night, the group huddled around a hibachi in a tatami room, remembering the terrible heat of a Taipei July and feeling as though they had been transported to another world. With the opening up of the Neng­gao Trail, Wu­she quickly became a major tourist destination, but for the Aboriginal people of the area, life became tougher and tougher. As the number of visitors grew, the Japanese continued to increase the scale of their facilities in ­Puli, making use of the Aborigines as cheap labor, and as they were put to work, their farms and hunting grounds went unattended. The Japanese demanded that the Aborigines shoulder-carry the trees that were cut down, paying no mind to the injuries and bleeding caused by the piercing cypress. If anyone stepped out of line, they would be beaten and have their pay docked. It was these occurrences of mistreatment that eventually led the Aborigines to rebel. 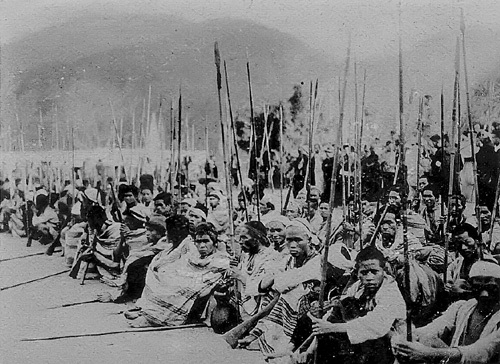 On 27 October, 1930, the chief of the Ma­hebo subtribe of the See­diq, ­Mona Ru­dao, led his men in a vicious attack, striking as the Japanese residents of Wu­she attended the local elementary school’s sports day and burning down the stations along the western part of the trail. The Japanese rapidly brought in reinforcements from throughout Taiwan to counterattack. The Aborigines fought tooth and nail, until they ran out of both food and ammunition, leaving the trail a bloodstained landmark in Taiwanese history. After the violence that followed what became known as the Wu­she Incident, the Japanese began to rebuild at Wu­she, planting cherry trees and rebuilding the stations along the trail, and eventually the tourists began to return. In 1942, the Japanese began building hydroelectric power stations, aiming not only to provide power to eastern Taiwan, but also to transmit whatever excess there was across to the west. A plan was made to link up Ji’an in Hua­lien and Wanda Reservoir in Nantou, but as World War II drew to a close and the Japanese surrendered unconditionally to the Allies, the plan was cut short and the Japanese departed from Taiwan. One Japanese official apparently remarked on leaving Taiwan, “When we leave, we leave Taiwan in darkness!” Fortunately, when the Republican government took charge of Taiwan in the wake of the Japanese departure, they immediately set up the Taiwan Power Company. Tai­power’s engineering department was put in the charge of Sun Yun-suan, a graduate of the Department of Electrical Engineering at Har­bin Institute of Technology. Under Sun’s leadership, within several months all of Tai­wan’s power network was linked up and restored. In 1950, with the help of US aid, Tai­power restarted the Japanese east-west plan, setting up engineering stations in ­­Puli and ­Liwu, and beginning to build a link from Tong­men to ­Wanda, crossing along the Nenggao Trail. The abandoned Japanese guard stations were rebuilt and repurposed as maintenance posts for the power line. From then, the trail began serving another purpose, becoming the main route for Taipower maintenance staff to inspect the lines and pylons. During the snowy winters, the workers had to risk bitterly cold snows to climb the pylons and clear off the ice and snow that would otherwise bring down the power lines. In honor of the hard work of those men and those who built the system, President Chiang Kai-shek himself produced the calligraphy for a plaque saying “Bringing light to all, benefitting the people,” which stands atop Mt. Nenggao. 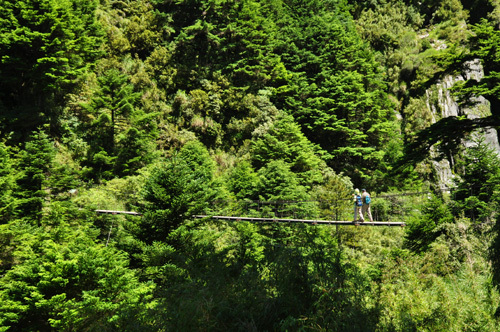 Nelson Young points out that the popularity of the Neng­gao Trail was not just due to its natural beauty, but also because, thanks to its use by Tai­power, it was particularly well maintained. All along the trail were maintenance posts that could be used, and for hikers, there is little more heavenly after a long day’s hiking than a nice warm shower. However, when Tai­power began moving to hydroelectric power generation in 1977 and building dams in the northern stretch of the Mu­gua River (­Kuaixi, Qi­lai, Xiao­long­jian, and four other dams), parts of the Nenggao Trail were left to landslides, reducing the length of the usable trail from its original 80-plus kilometers down to only 27 km from Tun­yuan to the Qi­lai trailhead. And as demand for power rose in eastern Taiwan, there was little excess to transmit to the west, so maintenance crews were scaled back, helicoptering in when needed. As a result of all of this, the trail gradually began to fall into disrepair. Fortunately, with the rise of the ­LOHAS movement in recent years, hiking has come back into vogue. With the beginning and ending sections of the old trail now traversable by car, people can be shuttled to and from the trail and can complete it in two days, making it much more amenable to visitors. In 2001, the Forestry Bureau began working on the National Trail System project, repairing trails and setting up informational signs. 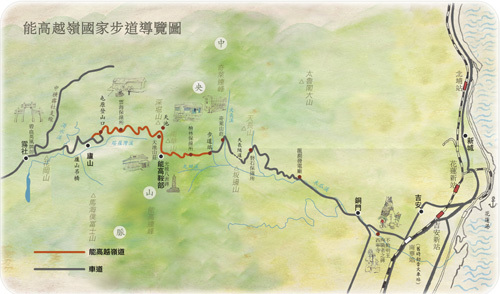 With this work, and the related studies of areas’ historical, cultural, and ecological qualities, new life was breathed into old trails like the Nenggao Trail. In recent years the eastern section of the trail has been hit by severe landslides, making it difficult going, so most hikers simply get shuttled from Wu­she to Tun­­yuan, start walking at the Tun­­yuan trailhead and head toward Tian­chi and then Mt. Nan­hua, or simply turn back at Tian­chi Villa. In this form, the trail is more than accessible to the ordinary person. 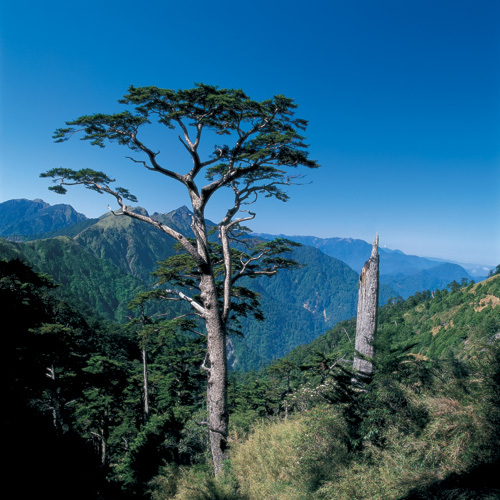 Ranging between heights of 2,000 and 3000 m above sea level, the trail passes through different forest belts, including sections that were once brimming with Taiwan red pine and Taiwan hemlock, but that due to forest fires have been reduced to mere corpses standing over alpine grasslands. The ruins of Ma­tsu­hara Kiln, situated near the Matsuhara guard post. Previous residents used the kiln for warmth, and much of its stone structure remains in good shape today. The main peak of Mt. Neng­­gao—a trail from Tian­­chi Villa runs straight to a lookout, from which visitors can take in the view of the local mountains, including the soaring 3,262-meter main peak of Mt. Neng­gao; this peak was ranked by the Japanese alongside Yu­shan and Mt. Xue as one of Taiwan’s three greatest peaks. Tian­chi—located 1.1 km from Tian­chi Villa. The gentle, rolling grasslands here are home to a stunning lake, from which the location takes its name: “Heavenly Lake.” The sky reflects breathtakingly in the lake’s surface, and at dawn and dusk it is particularly otherworldly. Neng­gao Saddle—situated along the main ridge of the Central Mountain Range, this is the dividing line between Nan­tou and Hua­lien Counties. A sweeping grassland, it offers wonderful views to the east of the Mu­gua River as it winds through the mountains; when the weather is clear, you can see out over the Pacific Ocean, and it is a spectacular spot from which to enjoy a sunrise. From its earliest days as a migratory trail for the See­diq people, through its use by the Japanese military and later the Taiwan Power Company, to its position today as a superlative hiking route, the Neng­gao Historic Trail has been many things over the years. Different people in different eras have looked upon this winding mountain trail with different eyes, but what has never changed is the spectacular mountain scenery and amazing natural beauty. Rich with stories, this historic trail has all the twists and turns of a great novel, and can feel for all the world like a Heaven on Earth.